Saturday morning fun activity: Got rid of excess grease and (dried up) dirt from chain, front/rear derailleur, chain-rings and sprockets. Greased these parts again. Pedaled for a few minutes and found that these parts caught dirt again. New and wet dirt though. Feeling great! Its rainy season, the season of potholes, puddles and muck on the road. Unless you are very lucky, you don’t get to see fresh water on the road when you are pedaling. Excluding the mud factor, this is the best season for joyful bicycle rides (especially if you have a mountain bike). My bicycle doesn’t come with a mudguard by default. 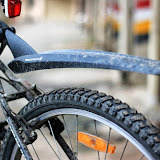 In my recent trip to US, I got this entry level mudguard (the one I can find in a sports store in the last minute of my shopping) made by Blackburn. The model is called Splashboard rear fender. I installed it last week (in a matter of a couple of minutes) and my early morning bicycle rides are much pleasant now. 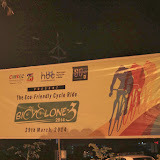 The fender is effective only around the speeds of 15kmph and for heavy dirt. I still see that the light (ash-like) dirt manages to fly to my shoulder level when I pedal at about 25kmph. Given the low number of stretches that allow me to pedal close to 25kmph, the fender is doing an okay job for me. The amount of post-ride helmet, dress and hair cleaning is drastically reduced now. With the fender, I am enjoying my biking along dirt roads a lot better. Here are a few pics of the fender and more importantly, the dirt on my bicycle. Good indication of the great mornings. 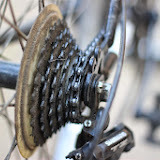 BTW, if you are looking for monsoon maintenance tips for your bike, you should read this blog post by The Bike Affair. Simple and very useful, as always.